Olympic and World champion, Ma Long returns to international action; having not competed since August, when he departed in the opening round in Bulgaria, losing to England’s Liam Pitchford, he is on duty at the forthcoming Seamaster 2018 ITTF World Tour Swedish Open. Matters commences in Stockholm on Thursday 1st November being preceded by three days of qualification. The quest for Ma Long in the Swedish capital city is somewhat threefold, to return to winning ways, to match the record of Vladimir Samsonov of Belarus and to reserve his place in the US$ 1,000,000 ITTF World Tour Grand Finals to be staged in Incheon, Korea Republic in December. Ma Long started the year in the manner to which we have become accustomed, quite simply, the backhand rock solid and the forehand on automatic pilot. On the Seamaster ITTF World Tour, he reserved the top step of the podium in both Germany and China but then in Japan, he was beaten at the quarter-final stage of the Men’s Singles event by the host nation’s Tomokazu Harimoto, before experiencing the early exit in Bulgaria. A new day, a time away from the international arena, notably he did not compete in late August and early September in the Asian Games in Jakarta, Indonesia nor in the more recent Liebherr 2018 Men’s World Cup in Paris. Ma Long has had time to recharge the batteries and is no doubt focused on regaining the title he won in 2011 when the tournament was also staged in Stockholm. Furthermore, simply by competing in the Swedish capital city this year, he will reserve his place in the Grand Finals; it will mean he has met the minimum five appearance criteria. Furthermore, should he win, then he will match the record of Vladimir Samsonov; Ma Long has 26 ITTF World Tour Men’s Singles titles to his name, Vladimir Samsonov has just one more. Similarly, colleagues Fan Zhendong and Lin Gaoyuan will take a step towards booking their places in the Seamaster 2018 ITTF World Tour Grand Finals. Presently on the Men’s Singles Standings, Fan Zhendong. beaten by Xu Xin also from China in last year’s final, is listed in second spot, Lin Gaoyuan in fifth place. Both have to date only appeared three times on this year’s ITTF World Tour but as well as competing in Sweden, their names appear on the ensuing Austrian Open list; thus they are in realistic terms Incheon bound. In Stockholm, Fan Zhendong is the top seed, Lin Gaoyuan, the no.3 seed, with Xu Xin sandwiched in between; Germany’s Dimitrij Ovtcharov is the no.4 seed but not having experienced the best of fortunes this year is not a current contender for the Grand Finals. Xu Xin, having played in six Seamaster 2018 ITTF World Tour Men’s Singles events heads the Standings. He is home and dry. Likewise on the Stockholm entry list, amongst the seeded players, Japan’s Tomokazu Harimoto and Jun Mizutani, alongside Hong Kong’s Wong Chin Ting and Germany’s Patrick Franziska can cement their Incheon places. All have met the five appearance criteria, on the current Standings, Tomokazu Harimoto is in fourth spot, Patrick Franziska four places lower, ahead of Jun Mizutani, in 10th spot and Wong Chun Ting in 13th position. Goals for Ma Long and there is one for Fan Zhendong, defeat in the final last year and also in 2013 when losing to colleague, Yan An but in both 2014 and 2015 he won. He seeks a third title, a feat since the tournament was first staged in 1954 only one player has achieved. 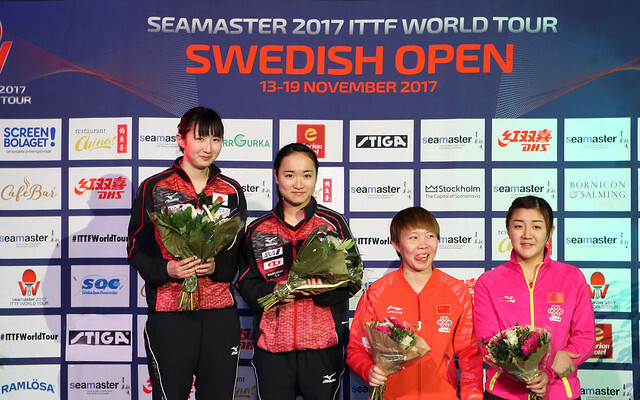 Compatriot Wang Liqin won in 1999 in Karlskrona, in 2001 in Skovde and in 2003 in Malmö; now Fan Zhendong for a third time? Ma Long and Xu Xin, especially, might have other ideas in what is an incredibly strong entry; of the top 20 players on the current Men’s World Rankings, a total of 17 compete in Stockholm.